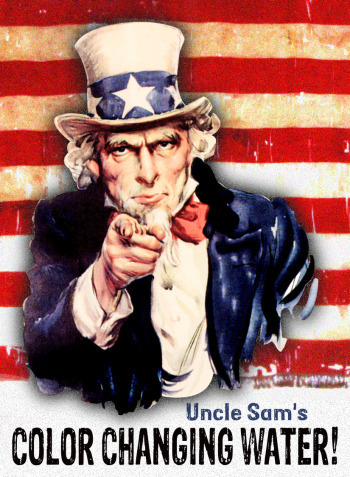 Today, when you order "Uncle Sam's Color Changing Water", you'll instantly be emailed a Penguin Magic gift certificate. You can spend it on anything you like at Penguin, just like cash. Just complete your order as normal, and within seconds you'll get an email with your gift certificate. Freedom fantasies and amazing magic all rolled into one! Show your true colors! As you pour clear water into three empty glasses, the water turns a different color in each glass. Red, white, and blue. Honor your audience with a magical tribute to Old Glory and fool the pants off 'em too! • Simply pour and adore! • Liberty and magic for all! • Easy to do and fun to perform! With your purchase of Uncle Sam's Color Changing Water, you'll receive the chemicals needed to perform this amazing trick about 16 times, brief instructions, and safe handling tips. Glasses and pitchers sold separately. Perform Uncle Sam's Color Changing Water, silently, to the Star Spangled Banner or create a story based on your own patriotism. Amazing in any venue... outside, inside, closeup, or stage! Must be at least 18 years of age to purchase.